The United States advanced to the semifinals with their most impressive win of the tournament. The game’s main interest was the hints it provided as to how the United States might approach their match against Germany. Though manager Jill Ellis retained the 4-4-2 structure she has employed throughout the tournament, her substitutions went beyond simple reactions to the absence of Megan Rapinoe and Lauren Holiday, both serving suspensions for yellow card substitutions. While Morgan Brian replaced Holiday as expected, Ellis brought in a true winger, Kelley O’Hara, rather than the converted striker Christen Press to replace Rapinoe. More importantly, she brought in Amy Rodriguez in place of Abby Wambach, a change that was both unexpected and revelatory. I concluded my analysis of the Colombia game with the wish that “Press might replace Wambach as a starter, bringing in Kelly [sic] O’Hara on the flank; but this will almost certainly not happen.” Ellis not only proved my assumptions about her conservatism wrong, she showed that she had a better solution to the problem than the one I envisioned. Rodriguez is a player whom I had not previously rated, but she may have been the second most important player on the pitch in this game. Notwithstanding her embarrassing miss in the opening minute, her tireless energy was absolutely critical to the high press employed with ruthless efficiency by the United States. The other revelatory player was Brian, who absolutely dominated the game from a holding role, demonstrating exactly the midfield control that has been lacking in the US game thus far in the tournament. 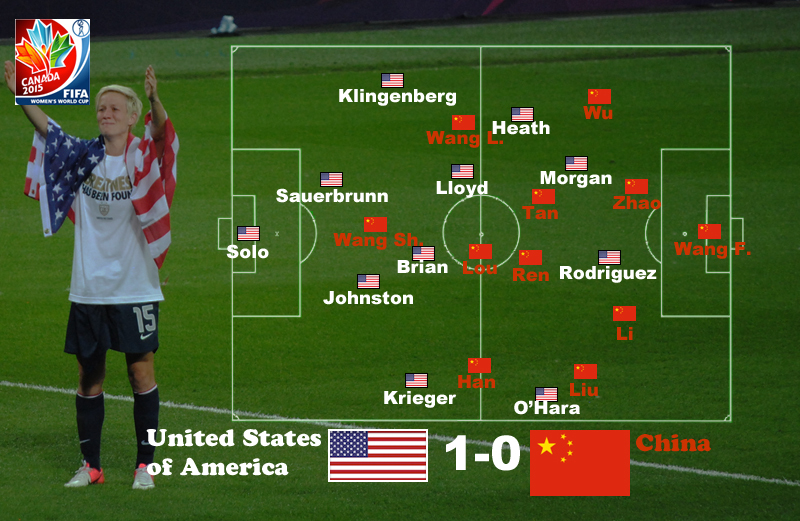 She was by some measure the most influential US player, and it is simply impossible to imagine the United States facing Germany without Brian in the line-up after this performance. The high press employed by the United States could well be a preview of their strategy against Germany in the semifinal. Though China lacks their attacking threat (and, as Kevin McCauley noted in a great pre-game analysis, China also plays in a truly unique formation that Germany won’t be replicating), France demonstrated in the their dominant quarterfinal performance that Germany can be beaten by an effective high press. Perhaps I am simply abandoning my hipster disdain a game too early to reap I-told-you-so credit, but I can now see a path for US victory that I believe Ellis might employ. The fundamental problem for the United States–and it is a real problem, meaning one without a clear solution–remains Carli Lloyd. This game exemplified the conundrum I first noted in my analysis of the US – Sweden game: Lloyd was demonstrably the greatest liability for the United States, while at the same time proving the team’s most consistent goal-scoring threat. She gave the ball away in the opening minute, and another misplaced pass at 34′ gave China virtually their only chance in the first half. It was astonishing that a midfielder could handle the ball as poorly as Lloyd did in a team that retained as much possession as did the United States, and it is difficult to believe that Germany will fail to capitalize should similar opportunities be presented to them. And yet Lloyd’s game-winning header was just as much a piece of her general play throughout the tournament as was her shocking passing. While there is no question that leaving Lloyd in the midfield will invite disaster against Germany, leaving her out may prove equally disastrous for a United States attack that has yet to show finishing ability elsewhere. Though others still see multiple selection dilemmas for Jill Ellis, I would guess that Brian and Rodriguez should now join Rapinoe, Morgan and the back five (including Hope Solo) as definite starters against Germany. Their contribution to the high press against China simply cannot be replaced. Moreover, as John D. Halloran has noted, it is Megan Rapinoe rather than Abby Wambach that has proven most dangerous against serious competition in the Ellis era (he also has some interesting data on Ellis’s overuse of Lloyd). That leaves open the right wing and one central midfield position. Though I would be tempted to bench Lloyd in place of Holiday as Brian’s midfield partner, this seems a bridge too far for Ellis (and perhaps detrimental to the US attack). That might seem to leave Holiday on the sidelines, with O’Hara, Heath, and Press battling for the spot at right wing (McCauley offers a thoughtful analysis of the virtues of each candidate for the position, adding Holiday to the mix as well). But a review of the United States line-up at the Algarve Cup in March, in which the US defeated France to win the tournament, suggests one other option. In the final of that tournament, Rodriguez joined Morgan up top and Brian paired with Holiday in midfield. But Lloyd was not absent; instead, she was deployed at right wing, as she had been earlier in the tournament. This option could allow Ellis to square the circle, though there is no question that Lloyd is a less natural winger than either O’Hara or Heath. However the United States set up, they will almost certainly seek to press Germany in the manner of France. With a less demanding quarterfinal opponent and a shorter game from which to recover, they will hope to succeed where an arguably more talented but less athletic French side failed. The result should prove an exciting game provided the United States defense can continue its sterling performance. UPDATE (6 February 2016): Follow this link to my recap of the United States – Germany semifinal.